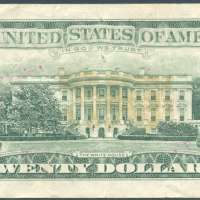 The United States of America | Twenty Dollars | This Note Is Legal Tender For All Debts, Public and Private | Washington D.C.
1988A (A-L). Andrew Jackson at center. Back: White House. Note: The note has been left in a glass in open air for a very long time and that answers the fade of the inks. Please help if you are able to read the inscription on the banknote. Thank you.